Deep green valleys, lined with trees, surrounded by snowy peaks where numerous waterfalls trickle; Can you guess what the name of that paradise is? I talk about the paradise Manali in the Kullu valley, which is also called “the Switzerland of India “. The dense cedar forests of the Himalayas and the river fed by glaciers from the surrounding mountains provide an atmosphere full of freshness to the Kullu valley. With breathtaking scenery, Manali is located on the main road to Spiti and Ladakh via Rohtang Pass (4000m). Manali is a small Indian town of less than 5000 inhabitants, situated in the State of Himachal Pradesh, which rises to over 2000 meters. Once famous for the quality of hashish, Manali has become a ski resort of fashion and an almost compulsory step before going into the adjoining valleys. Tourism there is much developed, but still has strong Manali attractions. 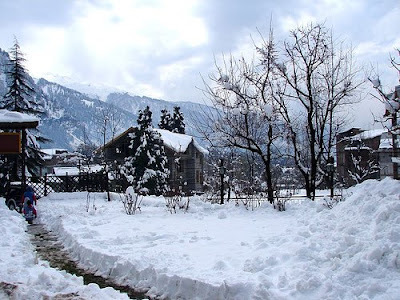 Many walks are available and the sites of Old Manali, Vashisht constitute a very beautiful destination. The inhabitants of these remote valleys still spend their winters around the fire spinning wool and weaving the famous blankets, shawls and 'topi' (cap room) Manali. You can make beautiful walks in the valley and discover rural villages like Malana, Kasol and Naggar, with traditional houses and temples. There are a multitude of activities to discover in this region; is an ideal spot for sports such as trekking, mountain biking, paragliding, skiing, rafting, canyoning, climbing it ... are many hot springs and is also a good place for aromatherapy. Life in the Kullu valley is mild and pleasant, but conditioned by the harsh mountain climates: an authentic experience to explore the Indian Himalayas.